PT. PINDO DELI PULP & PAPER . PT. INDOKOMAS BUANA PERKASA . PT. INDONESIA ETHANOL INDUSTRY . PT. PANASONIC LIGHTING INDONESIA . PT. AIR FAST INDONESIA . PT. ATAMORA SUKSES MAKMUR . PT. ALFA INDO PERKASA . PT. CAHAYA SEBELAS BINTANG . PT. CAHAYA TEKNIK ABADI . PT. GALANG KREASI INSTRUMENT . PT. PARKER ENGINERING INDONESIA . PT. PERTAMINA GAS JAMBI . PT. ENI MUARA BAKAU B. V .
PT. ESTETIKA DAYA MANDIRI . PT. PERTAMINA HULU ENERGI . PT. PERTAMINA ASSET 3 SUBANG . PT. PUTRA DHARMA HARMOTEKNIK . PT. REKAYASA KARYA SEJAHTERA . PT. CAPITAL TURBINES INDONESIA . PT. KWALITY OILTOOLS SUPPLY . PT. SINAR MEGA ANTARKREASI . PT. MAXIM KARYA ANUGERAH . PT. PLTU LABUHAN ANGIN . PT. VINCO PUTRA MANDIRI . PT. AZBIL BERCA INDONESIA . PT. TETAS GAGAH MULIA . PT. PASIFIC FOOD INDONESIA . PT. AMERTA INDAH OTSUKA . PT. EXEDY MANUFACTURING INDONESIA . PT. BUNTARA INTI MEGAH . PT. SADIKUN NIAGA PRIMA . PT. MEGMILK SNOW BRAND INDONESIA . PT. MUTIARA INTI RAYA . PT. AKS PRECISION BALL INDONESIA . PT. MERCURY TEKNINDO INTERNUSA . PT. KRAMA YUDHA RATU MOTOR . CV. DINAR RAYA SEJAHTERA . PT. CONSERVE TECH INDONESIA . PT. SASANA CITTA HUSADA . PT. GEPTRONIKA SENTOSA UTAMA . CV. HERLY CITRA MANDIRI . CV. 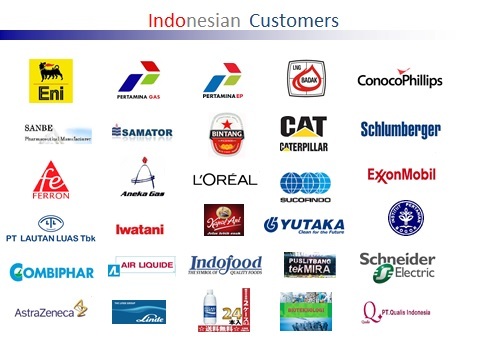 AIRINDO TECHNICAL SUPPLY . PT. PUTRA JAYA SUKSES MAKMUR . PT. AIR LIQUIDE INDONESIA . PT. SUPRA TECH INDONESIA . PT. MORITA PRECISION INDONESIA . #purchase order from mercury teknindo as baxcell condensate pot assy. #purchase order from otsuka indonesia, lawang, Malang plant as spare part toray oxygen analyser assy. #purchase order from mkp as subsidarry swadaya group surabaya as material instrument supply.